Powers/Abilities: M'Nell was born to an elite Kree family and was a ranking member of the Kree military. He was well-trained in hand-to-hand fighting and the use of weaponry. His armored Kree suit incorporated wrist-mounted energy blasters and was capable of flight. His body was later strengthened and revitalized by Nega-radiation, fostering superhuman-class strength and stamina plus at least enhanced durability. He also initially worshiped the Supreme Intelligence and had a temporary mental link with it. (Imperial Guard I#2 (fb) - BTS) - In the wake of the Nega-bomb's detonation on the Kree home world of Hala, which killed 90% of its population, M'Nell was one of the surviving blue-skinned Kree. He was then conscripted into the Shi'ar Imperial Guard as Hala was absorbed into the Shi'ar Empire. (Imperial Guard I#1) - Commando, dispatched with other members of the Imperial Guard to Earth, observed humans in New York with the aid of holoplasmic human disguises. They encountered the three Avengers, Black Widow, Hercules and Quicksilver, in battle with the Underground Militia and charged in to aid them. At this point, M'Nell was not aware that the Underground Militia were really renegade Kree convicts seeking to punish Earth for Operation Galactic Storm. The Militia members were soon overcome by the assembled heroes and retreated although a nearby building collapsed with Commando using his wrist blasters to destroy the falling debris to protect onlookers. The Guardsmen, once more disguised, then merged back into the crowd. Two days later, a restless Flashfire taunted the Kree member and his devotion to the Supreme Intelligence, chucking aside his small shrine to the Kree being. A small fight broke out between the two but was quickly halted by Gladiator. Earthquake then informed the Guardsmen of the reappearance of the Underground Militia in Washington Square Park and the team flew off to confront them. M'Nell was privately concerned by Gladiator's assertion that humans had never harmed another world as he was aware of rumors that contradicted it. However, the Militia then attacked and the Imperial Guard fell one by one as all - excepting Commando - were weakened by the radiation from the Militia's hidden Nega-reactor. (Imperial Guard I#2) - The defeated Guardsmen were restrained underground and left severely weakened by the radiation. Initially unconscious, M'Nell woke with the Supreme Intelligence's urging - although M'Nell was not aware of the origin of the soft voice inside him. The Nega-radiation instead greatly augmented M'Nell's strength and he easily broke free of his restraints, tearing his uniform's arm coverings as he did so. He quickly freed his colleagues and they recovered as they moved away from the hidden source of radiation. The group then once more encountered the Militia and a battle ensued. Commando's newfound rage impressed Flashfire. Victorious, the Guardsmen left the underground location to escape the radiation, although M'Nell was confused why it should invigorate and strengthen him so much. Later, M'Nell became strangely aware, again with the hidden mental prodding of the Supreme Intelligence, that the Underground Militia were actually comprised of pink-skinned Kree and informed his fellow Guardsmen. Still confused, M'Nell pondered his new vitality and why he began to actually relish being a Guardsman. They soon left again and easily beat the Underground Militia once more and Commando recognized the value of his new "intuition". (Imperial Guard I#3) - Commando searched within himself to find any further insights but to no avail. Further investigation under Manhattan revealed the Underground Militia, all panicking at Primus' mad plan to detonate a Nega-reactor below New York as a reprisal. Inspired by Gladiator, Commando followed the Guard and confronted Primus on top of the Nega-reactor, which was rapidly heading to meltdown. Rick Jones, newly empowered by the Supreme Intelligence, suddenly appeared and absorbed as much Nega-radiation as he could. Commando was again surprised at his own admiration of the valiant efforts of both the Shi'ar Guard and the Earthling. After Electron freed the reactor, Commando joined in with his fellow Guardsman at blasting the reactor with as much power as possible to reduce it to molten metal slag to seal the deadly inner mass. Commando whacked Primus down as Gladiator then carried the toxic reactor into space so that the nuclear waste could do no more harm. However, Gladiator, severely weakened, began to fall to Earth burning up in the atmosphere until he was suddenly rescued by Commando, who called the Shi'ar Praetor his friend. 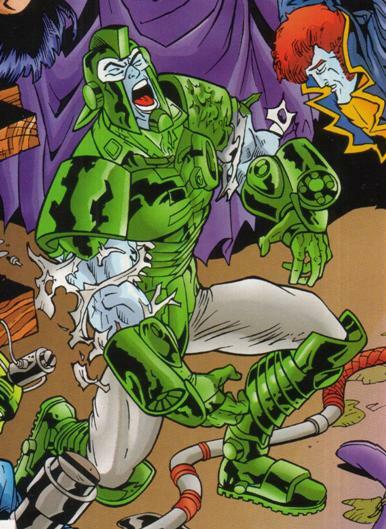 Both quickly returned to the underground lair only to see the green energy within Rick Jones pour out and reform as the Supreme Intelligence, which told the gathered Guardsmen that it had allowed the Nega-bomb to detonate. Incredulous, Commando was staggered by this revelation. Compounding this, the Supreme Intelligence tried to tempt M'Nell to turn on the Shi'ar Guardsmen and join it as its right hand. 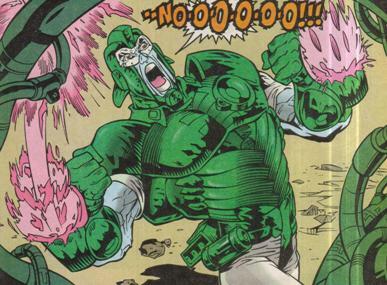 Enraged, M'Nell fired wildly at the Supreme Intelligence and the would-be Kree god left, rejecting M'Nell. However, Commando was then embraced by his fellow Guardsmen and left the sewers with them. (Realm of Kings: Imperial Guard#1) - Joined by Manta, Fang, Starbolt and Hussar, Commando was part of the Imperial Guard's strike force dubbed Morning Star against the rebellion forming in the Shi'ar shipyards of Izumbard. Comments: Created by Brian Augustyn (writer), Chuck Wojtkiewicz (pencils) and Ray Snyder (inks). Note that the name "M'Nell" is an obvious reference to Legion of Super-Heroes member Mon-El, continuing the tradition of Legion references among the Imperial Guard. Commando was also one of the Imperial Guard members active in the novel X-Men: Empire's End by Diane Duane. It has to be seen if this story is canon.